ICYMI: The D2 Team Went LIVE on Facebook! 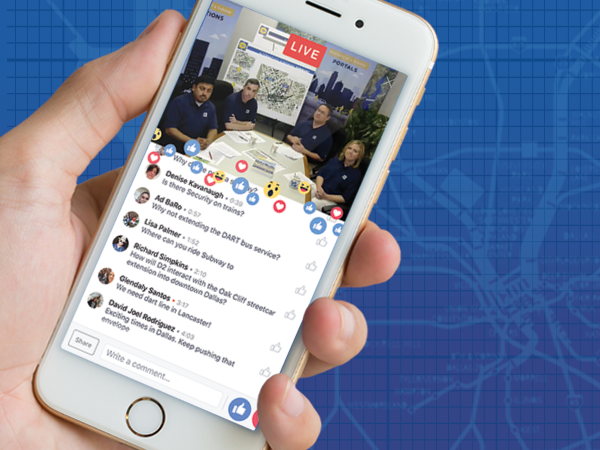 Last week, DART’s D2 Subway team took to Facebook Live to share all the recent information about North Texas’s newest second rail alignment. Team members, Kay, Carlos, Ernie, and Chad answered your questions about the project development process, funding, and what’s next for the D2 Subway. Expanding capacity. First, Chad described just why the D2 Subway is important for North Texas. Did you know that this second rail alignment will provide more capacity not just for downtown Dallas but for the entire DART system? Right now, all four lines travel the same tracks through downtown Dallas.But adding the D2 Subway will give operational flexibility and more capacity for riders coming in and out of city center. Choosing the route. Kay spoke in depth about the process of choosing a final alignment for the D2 Subway (also known as the Locally Preferred Alternative). One end of this second rail alignment would be Victory Station and the other end would be located at Swiss Avenue. Three connecting corridors are currently being evaluated. The D2 Subway could run parallel or underneath Elm Street, Commerce Street, and Pacific Street. So how will DART choose just one of these three options? Kay indicated that there are many factors used to evaluate these alternatives; including, cost, ridership, transferability, and potential impacts. Completing the project. When can we see this project actually become operational for public use? Chad mentioned that the projected date for opening is currently set for the end of 2024. Building a subway in downtown Dallas is complicated and there are right-of-way questions, procurement variables, and impact issues that may impact the construction of the D2 Subway. Didn’t get a chance to tune-in? No worries, you can find a recording of our Facebook LIVE here. And to find out more information about the D2 subway project development process visit our D2 Subway homepage here. This entry was posted in D2. Bookmark the permalink.